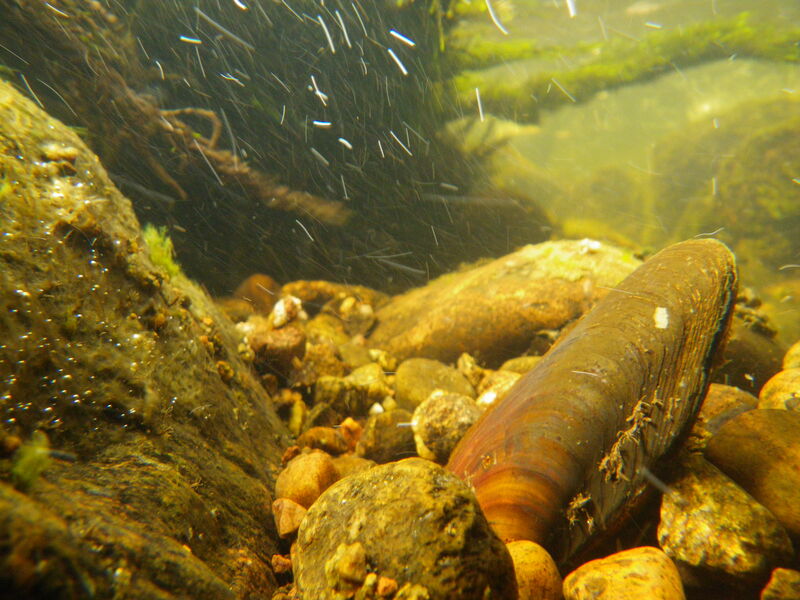 Freshwater pearl mussels are one of the most fascinating European freshwater species: with an extremely long life span (around 120 years is possible) and a complex reproduction process that relies on larvae which attach to the gills of fish. We spoke to Jackie Webley from the EU LIFE project Pearls in Peril about these special creatures and their unique ecology last year. Freshwater pearl mussel conservation is a complicated process, as the mussels require different habitats at different stages of their life cycle. As Clemens Gumpinger, Christoph Hauer and Christian Schedern – editors of a recent special issue of the freshwater ecosystem journal Limnologica – put it, “an appropriate freshwater pearl mussel habitat must meet two seemingly diametrically opposite requirements: there must be stable substrates that keep both juvenile and adult mussels from being swept away, and at the same time an unclogged interstitial (i.e. the gaps in the sediment substrate) that provides for permanent oxygen supply.” As such, freshwater pearl mussels are particularly sensitive to changes in ecosystem habitats, particularly those caused by humans either clearing, covering or clogging up sediments on river beds. The special issue in Limnologica – a journal edited by MARS leader Daniel Hering – brought together a diverse set of papers on the theme of “The current status and future challenges for the preservation and conservation of freshwater pearl mussel habitats”, which are available for free here. To find out more about the special issue, and freshwater pearl mussel conservation in general, we spoke to co-editor Christoph Hauer from the University of Natural Resources and Life Sciences in Vienna. Freshwater Blog: Hi Christoph: why did you choose to focus on freshwater pearl mussels for this special issue? Christoph Hauer: Freshwater pearl mussels are one of the best examples for an umbrella species in river systems, This depends on their long lifespan (up to 120 years) and the complexity in reproduction (including host fish) and habitat use for various life stages. What are the main threats to freshwater pearl mussel populations, and what is being done to address these threats? The main threats to pearl mussels are – as for most aquatic organisms – human alterations to freshwater habitats. To address these threats we need greater awareness about the problems in public, legal and scientific spheres. Here, the special issue of Limnologica might contribute to raising awareness amongst stakeholders involved in and affected by river management. Tell us about the special issue of Limnologica: who is involved in it, and what are some of the most interesting findings and arguments? Contributions from across Europe are featured in the special issue. Although some specific topics on pearl mussel life-cycles and related problems are addressed (e.g. recruitment), a key trend was that the type and consistency of sediments in mussel habitats is one of the biggest issues for their conservation. Another key concluding outcome was the need to address scale in defining freshwater pearl mussel processes and threats. Frequently, mussel habitats are investigated on a very small-scale. The decisive boundaries for these mussel habitats, however, are often determined or influenced on a larger (e.g. catchment) scale. The need for addressing such issues of scale in freshwater pearl mussel habitat studies was highlighted in the special issue several times. Read the open access special issue of Limnologica online here.